Newborn baby care - Pros and Cons of baby day care. Providing newborn baby care is a decision you'll want to make after you carefully consider what is involved in the day-to-day routine and weigh the pros and cons. Let me help you with some of each, read on. What are some of the "Pros" for newborn baby care? A new born baby! They are so irresistible- You just want to take them in your arms and hold them. When you start a newborn in your child care, chances are they are going to be full time child with a nice full time income. Plus they more than likely will be with you for 2-3 years. That is nice job security. I would guess 95% of my calls are for newborn baby care. Parents want the love, security and safety of a Family Child Care provider. They want their baby in a home atmosphere which is exactly what YOU can provide for them. You can charge more for infant care, therefore you can earn more money. It also can be relatively easy if the baby isn't fussy. Most of the time a newborn baby sleeps a lot. Providing baby day care can help you be sought after as many child care homes or centers won't take newborns. 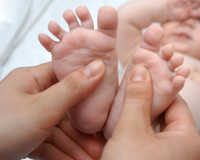 As a newborn matures, you will get to enjoy all of their amazing Stages of Child Development. 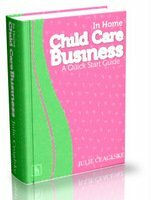 You will be able to teach the toddlers and preschoolers in your day care about baby care. They will be like a big brother or a big sister! Be sure to check with your state regulations for the number of newborns you may care for at a time. Know your personal limit, too. Okay, there are lots of other pros for newborn baby care.But with the "pros" of course there will be "cons" and please read these and decide what is right for you and your daycare home. This website has current information for Parents as well as for child care providers. A newborn can be fussy. They need A LOT of attention and care. Do you have the time, patience and energy? Not to mention dealing with Bottle Feeding Infants. Eventually they will go through Newborn Separation Anxiety. This does not have to be a stressful time, and it is NORMAL. You will need newborn equipment (Can be costly $$)... Cribs, high chairs, diapering, swings, strollers, safety gates, age appropriate toys, etc. Make sure you have a good rocking chair. Ask you local DHS or Child Care Resource and Referral Agencies if they can supply you with any. I have been able to get small cribs and safety gates through our local CCR&R. Providing baby care has given me some of the most rewarding and gratifying days in my years as a child care provider. I won't lie to you... I have had many challenging days where I've wondered what I was thinking!!! It is NOT for everyone. You have to decide. I have learned that you need to take baby day care ONE DAY AT A TIME. That's how I've done new born care for so many years! Our friend Shirley R. Wrong is really only 23 years old, but she took on 5 babies all under the age of 9 months. Her picture should teach you something about how many babies you want to watch at one time. Remember, they NEED AND DEPEND ON YOU! Appreciate the moments of holding them in your arms and the miracle that they are! Be delighted when newborns give you one of their first true smiles!